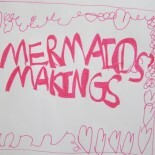 This is Lil Mermaid`s school project. Everybody had to make a 3- d project about their hometown. So she made our street, complete with church and cornershop. One of my favourite activities in autumn is leaf printing. Aren`t they just beautiful!!!! *** Linked to: “It`s Playtime!” “Craft Schooling Sunday! Want to see what`s inside these cute boxes?